A dirty air filter prevents the engine from breathing properly, which can decrease fuel mileage and performance and make the engine work harder than it needs to. Let your vehicle breathe! Change the air filter once a year or more often if you drive in dirty or dusty conditions. Often, brakes have wear indicators that produce noise when it’s time to change the pads. Or your brakes may “feel” different when you press on them. 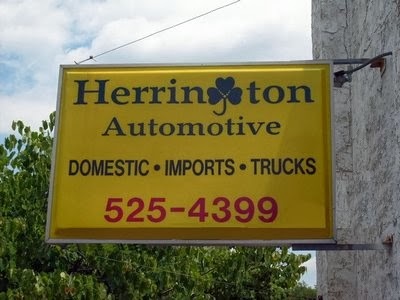 If you think there may be a problem with your vehicle’s brakes, have Herrington Auto take a look. Our brakes are certified to federal safety standards. Extreme heat and cold are hard on automotive batteries. If your vehicle is a few years old, have the battery and charging system tested to be sure that your battery has the power to start your vehicle and that your alternator is recharging the battery as it should. A cooling system that is clogged or low on fluid can cause serious damage to the engine and other components. Get into the habit of checking the fluid level regularly, and have the fluid changed or flushed when recommended. Don’t wait for a rainy day to discover that your windshield wipers are worn and need replacement. Worn wipers can hinder visibility in rainy or snowy conditions. ACDelco’s Beam Blades have a curved design that conforms to the shape of your windshield and provides constant pressure for a smooth, uniform wipe. Though many spark plugs are designed to last 100,000 miles, they can still get dirty or fail prematurely. Ignition wires lose insulating ability over time, and the connection to the plug or ignition coil can degrade as well. Having your service technician regularly inspect your ignition system can help you avoid conditions that may result in poor performance or reduced fuel economy. The suspension system affects your vehicle’s steering, braking power, and stability, so it’s important to have these functions inspected regularly and to replace parts when they become worn — and dangerous! It’s also important to have other chassis items, such as tie-rod ends, control arms, and ball joints, checked periodically. Automatic transmissions have become more sophisticated with additional gears and computerized electronic controls and are designed to work with the engine controls for best operation. Have the transmission inspected and serviced as recommended in the owner’s manual.